Department of General Surgery, Peking University First hospital, 8th Xishiku Street, Beijing 100034, People's Republic of China. The special anatomical position accounts for unusual clinicopathological features of uncinate process cancer. This study aimed to compare clinicopathological features of patients with uncinate process cancer to patients with non-uncinate process pancreatic head cancer. Total 160 patients with pancreatic head cancer were enrolled and classified into two groups: uncinate process cancer and non-uncinate process pancreatic head cancer. We found that the ratio of vascular invasion was significantly higher in patients with uncinate process cancer than in patients with non-uncinate process pancreatic head cancer. In addition, the rate of R1 resection was significantly higher in patients with uncinate process cancer. Furthermore, the median disease-free survival (11 months vs. 15 months, p=0.043) and overall survival (15 months vs. 19 months, p=0.036) after R0 resection were lower for uncinate process cancer. Locoregional recurrence was more frequent (p=0.017) and earlier (12 months vs. 36 months; p=0.002) in patients with uncinate process cancer than in patients with non-uncinate process pancreatic head cancer. In conclusion, uncinate process cancer is more likely to invade blood vessel and has worse prognosis due to the earlier and more frequent locoregional recurrence. Keywords: pancreatic head cancer, uncinate process, survival, prognosis, recurrence. The uncinate process is a hook like extension from the lower part of the head of the pancreas, and it extends superiorly and posteriorly behind the superior mesenteric vein (SMV), and ends either to the right side or extending behind the superior mesenteric artery (SMA) . Compared with the other parts of the head, the uncinate process is closer to the mesentery. The special anatomical position of uncinate process accounts for the peculiar clinicopathological features of the uncinate process cancer [1-9]. However, few reports have compared the clinicopathological features and prognosis of uncinate process pancreas cancer with those of non-uncinate process pancreatic cancer. Therefore, in this study we investigated the clinicopathological features and prognosis in patients with uncinate process cancer compared to patients with non-uncinate process pancreatic head cancer. From January 2010 to December 2014, 160 patients with pancreatic head cancer referred to Peking University First Hospital were included in this study. Among them, 85 patients were pathologically confirmed as pancreatic ductal adenocarcinoma and the other 75 patients were diagnosed by CT imaging and CA 19-9. All patients diagnosed other than ductal adenocarcinoma such as ductal-endocrine carcinoma, intraductal papillary mucinous carcinoma, and signet ring cell carcinomas were excluded. The clinicopathological data were collected from electronic medical record system, and patients who underwent surgical resection were followed up every 3 months. Based on dedicated pancreatic multi-detector computed tomography (MDCT), patients were classified into two groups: the uncinate process cancer and the non-uncinate process pancreatic head cancer. All CT scans were reviewed blindly by two experienced radiologists, and interpretations were achieved by consensus. Of these 160 patients, 55 patients had tumors located in the uncinate process of the pancreas, including 31 men and 24 women who aged from 23 to 83 years (mean age 63.8 years), and the other 105 patients had non-uncinate process pancreatic head cancers, including 65 men and 40 women who aged from 39 to 85 years (mean age 63.1 years). Of the 55 patients with uncinate process cancer, 24 patients received classical pancreatoduodenectomy, one patient received total pancreatectomy, 11 patients received open bypass, and 19 patients had no operation. In addition, 6 patients underwent combined partial or segmental resection of SMV/PV and reconstruction. Of the 105 patients with non-uncinate process pancreatic head cancer, 36 patients received classical pancreatoduodenectomy, 2 patients received total pancreatectomy, 2 patients received pylorus preserving pancreatoduodenectomy, 19 patients received open bypass and biopsy, 1 patient received only open biopsy without bypass, and 45 patients had no operation. In addition, 7 patients underwent combined partial or segmental resection of SMV/PV and reconstruction (Table 1). The types of treatments for the patients. PPPD, pylorus-preserving Pancreatoduodenectomy; a synchronous ductal adenocarcinoma located at body; b synchronous IPMN located at body and tail. Adjuvant chemotherapy including six cycles of gemcitabine (1000 mg/m2, 30 min intravenous infusion on day 1, 8, and 15) was performed in 17 patients of the 65 patients who underwent resection. 5 patients received only 1-2 cycle chemotherapy and the other 43 patients refused adjuvant chemotherapy. Among the other 95 patients who did not undergo curative resection, only 10 patients received chemotherapy, and the other 85 patients did not receive chemotherapy due to a poor performance or refusing chemotherapy. SPSS version 19.0 (IBM Corp.) was used for statistical analysis and data management. The values were presented as the mean ± SD, medians (interquartile range), or numbers and percentages. Chi-Square analysis or Fisher's exact test were used to compare categorical data. Continuous variables were compared using the t test or Mann-Whitney test. Survival curves were constructed using the Kaplan-Meier method and the statistical significance of differences in survival was determined using the log-rank test. The Cox-Hazard model was used for the multivariate analysis. A multivariate analysis was conducted using the factors that were significant in the univariate analysis. A two-sided P value less than 0.05 indicated significant difference. ALT, alanine aminotransferase; AST, aspartate aminotransferase; TBIL, total bilirubin; DBIL, direct bilirubin; CA 19-9, carbohydrate antigen. The main clinical characteristics of the patients were shown in Table 2. Upper abdominal pain, weight loss and jaundice were the three main symptoms, and were not significantly different between the patients with uncinate process cancer and the patients with non-uncinate process pancreatic head cancer. In addition, there were no significant differences in serum bilirubin level, liver function or CA 19-9 between the two groups. 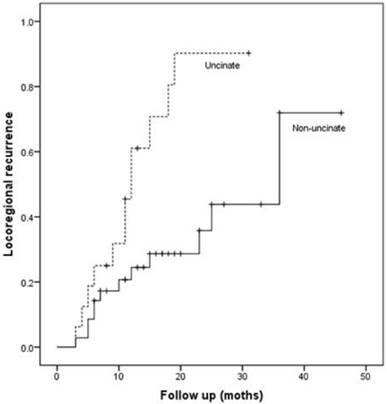 The mean size of tumors in the uncinate process was 3.43 cm (range 1.0-7.3 cm) (Table 3). In the non-uncinate process pancreatic head, the mean size of tumors was 3.44 cm (range 1.0-7.6 cm). The tumor size was not significantly different between the two groups, as well as the dilation of pancreatic duct and dilation of common bile duct. However, the percentage of vascular (SMV/PV and/or SMA) invasion was significantly higher (P=0.019) in patients with the uncinate process cancer (32/55 patients, 58.2%) than in patients with non-uncinate process pancreatic head cancer (40/105 patients, 38.1%). Moreover, SMA encasement was diagnosed more often (P=0.011) in patients with uncinate process cancer (17/55 patients, 30.9%) than in patients with non-uncinate process pancreatic head cancer (14/105 patients, 13.3%). In addition, the chance of SMV invasion (P=0.026) and PV (P=0.001) invasion were significantly higher in the patients with the uncinate process cancer. According to the AJCC TNM Staging of Pancreatic Cancer (seventh edition, 2010), 23 uncinate process cancer patients and 44 non-uncinate process pancreatic head cancer patients were diagnosed with stage III or IV disease, respectively. The rate of R0 resection was not significantly different between two groups. However, the rate of R1 resection (with microscopically residual tumor) was significantly higher (P=0.019) in patients with uncinate process cancer (9/55 patients, 16.4%) than in patients with non-uncinate process cancer (5/105 patients, 4.8%). Typical staining of the uncinate process cancer was shown in Fig. 1. The features of the tumors. c tumor contact with SMA >180°. AJCC, American Joint Committee on Cancer. Typical staining of the uncinate process cancer. Magnifications: 1:200 (A, B, C) and 1:40 (D). 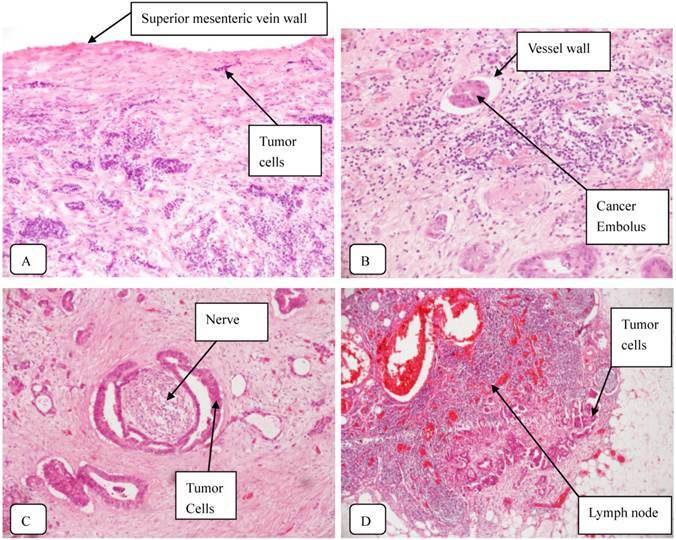 A: SMV invasion; B: Vascular cancer embolus; C: Perineural invasion; D: Lymph node metastasis. The median follow-up was 15.0 months (range 5-46 months) for the 65 patients who underwent curative resection. At the last follow-up, 48 patients (73.8%) died of pancreatic head cancer recurrence, 3 patients (4.6%) died of other causes, 2 patients (3.1%) were alive with disease and 12 patients (18.5%) were alive with no clinical or radiographic evidence of disease. The median overall survival after resection (R0 and R1) was 16.0 months (95% CI: 13.5-18.5 months). The median overall survival of patients after R0 resection was 18.0 months (95% CI: 16.2-19.8 months), significant higher than that of patients after R1 resection (11.0 months, 95% CI: 7.4-14.6 months; P=0.001). The overall 1- and 3-year survival rate of the patients after R0 resection was 68.3% and 19.2%, respectively. Although we found no significant differences in clinicopathological characteristics between the two groups after R0 resection (Table 4), the median overall survival after R0 resection was lower for uncinate process cancer than non-uncinate process pancreatic head cancer (15 months vs. 19 months, P=0.036, Fig. 2). Clinicopathological characteristics of patients after R0 resection. Kaplan-Meier curve for overall survival in patients after R0 resection according to the tumor location. The median disease-free survival was higher in patients after R0 resection than in patients after R1 resection (median, 13 months vs. 6 months; P<0.001). The disease-free 1 and 3-year survival rate of the patients after R0 resection was 50.8% and 13.4%, respectively. Follow -up data showed that recurrence occurred in 37 patients (72.5%) of the 51 patients after R0 resection (Table 5). Notably, locoregional recurrence was the most common for the uncinate process pancreatic head caner, and systemic recurrence was the most common for the non-uncinate process cancer. 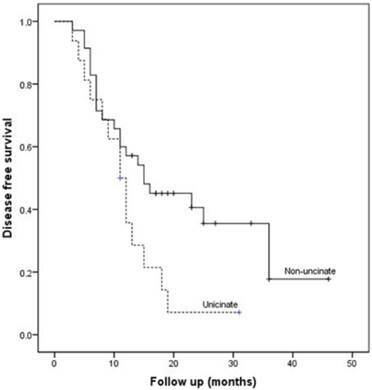 Patients with uncinate process cancer had significantly worse disease-free survival (median 11 months) than those with non-uncinate process pancreatic head cancer (median 15 months, P=0.043, Fig. 3). Locoregional recurrence had higher frequency (P=0.017) and earlier development (median, 12 months vs. 36 months; P=0.002, Fig. 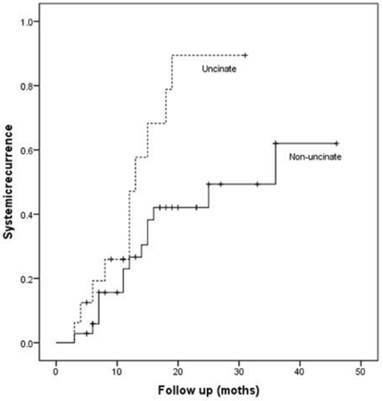 4) in patients with uncinate process cancer than in those with non-uncinate process pancreatic head caner. In addition, systemic recurrence had earlier development (median, 13 months vs. 36 months; P=0.027, Fig. 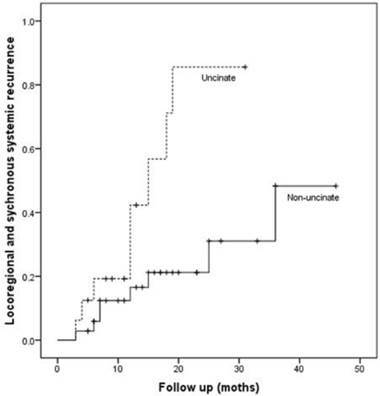 5) in patients with uncinate process cancer, as well as locoregional and sychronous systemic recurrence (P=0.007; Fig. 6). Kaplan-Meier curve for disease-free survival after R0 resection according to the tumor location. Locoregional recurrence in patients after R0 resection according to the tumor location. Systemic recurrence in patients after R0 resection according to the tumor location. Locoregional and sychronous systemic recurrence in patients after R0 resection according to the tumor location. Univariate survival analysis shows that the location, margin status, LN metastasis, and the number of positive lymph node were significant predictors for both disease-free survival and overall survival (Table 6). Tumor differentiation and vascular cancer embolus correlated with disease-free survival, but not with overall survival. CA 19-9 correlated with overall survival, but not with disease-free survival. Multivariate analysis showed that the location, margin status and LN metastasis were independent prognostic factors for disease-free survival, and the location and LN metastasis were independent prognostic factors for overall survival (Table 7). Univariate analyses of disease-free and overall survival of patients after resection. HR, Hazard ratio; 95% CI, 95% confidence interval; AJCC, American Joint Committee on Cancer. Multivariate analysis of disease-free and overall survival of patients after resection. The pancreatic primordium consists of two buds: dorsal and ventral. The uncinate process is derived from the ventral bud. Anatomically, the uncinate process represents a hook like extension of the lower part of the pancreatic head and is located closely to the superior mesenteric artery and vein . This particular anatomical feature may result in specific clinicopathological features of the uncinate process. Previous studies showed that vascular invasion was frequent in patients with the uncinate process cancer, and the rate of R1 resection was significantly higher in these patients [7-9]. In this study, we confirmed that the percentage of vascular invasion, especially SMA encasement was significantly higher in patients with uncinate process cancer. 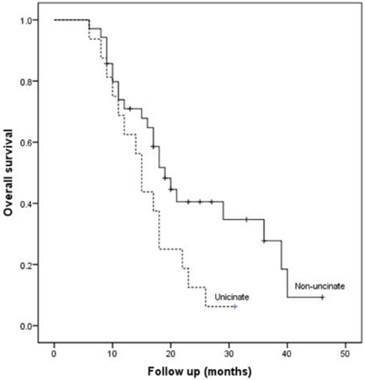 Furthermore, more patients with uncinate process cancer underwent R1 resection. However, no significant differences were found between the two groups in the incidence of jaundice and the dilatation of common bile duct, inconsistent with previous studies [7-9]. It was suggested that patients with uncinate process cancer had worse prognosis accompanied by earlier and more recurrence than patients with non-uncinate process pancreatic head cancer [7, 8]. In this study, we found no significant difference in clinicopathological characteristics between the two groups after R0 resection, but the overall survival was lower for the patients with uncinate process cancer, and more and earlier locoregional recurrence was observed in the patients with uncinate process cancer. So far, little is known about the mechanism and cause of recurrence of uncinate process cancer. Currently, the impact of margin status on overall and disease-free survival remains controversial . In this study, we found that patients who underwent R0 resection had better overall survival and disease-free survival than those who underwent R1 resection, in agreement with previous studies [11, 12]. Furthermore, resection margin was an independent significant prognostic factor in pancreatic cancer [13, 14]. The goal of operation treatment is to achieve R0 resection. For patients with venous involvement, en bloc resection of PV/SMV was not associated with increased morbidity or mortality compared with patients who did not require vein resection, and the rate of R0 resection and overall survival were not different between the two groups [15-18]. SMA (retroperitoneal/uncinate) margin clearance has become a major concern in the operation treatment for uncinate process cancer. The lymph node metastases and extrapancreatic nerve plexus invasion alongside the SMA have been recognized in numerous studies [19-23]. Furthermore, a meta-analysis of radical resection rates and margin assessment in pancreatic cancer indicated that the most commonly involved margins are the SMA, PV/SMV, and posterior margins . However, the division of the retroperitoneal tissues between the uncinate process and SMA with a stapler may leave some areolar and lymphatic tissue and increase the risk of R1 resection . Jing et al. demonstrated that extended pancreaticoduodenectomy combined with full-length SMA isolation could achieve the goal of R0 resection, and improve the quality of life and survival rate of patients . However, the reported R1 rate showed high variation (17-85%) due to the lack of consensus on the definition of microscopic margin involvement and standardized protocols for pathological examination [10, 27]. R1 rate was highly underreported in some studies, which may lead to the discrepancy between margin status and clinical outcome [28-31]. A series of studies have supported that patients with wider margins (> 1 mm) have better overall survival and disease-free survival than patients with direct invasion of tumor cells within 1 mm of the resection margin, and many centers have adopted a minimum clearance of more than 1 mm to define R0 resection [32-34]. However, a recent study reported that a margin clearance of 2 mm or more was significantly linked to improved overall survival and the R1 definition might have to be adapted . In this study, resection margins including SMA, SMV/PV, pancreatic neck, bile duct, enteric and anterior surface margins were evaluated independently, and R0 resection was defined as a minimum clearance of more than 1 mm. The limitation of this study is that many patients did not receive adjuvant therapies. Recurrence rate of pancreatic cancer was still high. Adjuvant therapies that impact on recurrence were necessary. It has been proved that adjuvant therapies can improve outcomes, although there is no consensus of standard adjuvant treatment after resection. In conclusion, compared with non-uncinate process pancreatic head cancer, uncinate process cancer had a significantly higher incidence of vascular invasion. Specifically, the chance of SMA encasement, SMV invasion and PV invasion was significantly higher in patients with uncinate process cancer. In addition, the rate of R1 resection (with microscopically residual tumor) was significantly higher in patients with uncinate process cancer. Furthermore, after R0 resection, patients with uncinate process cancer had a worse prognosis than patients with non-uncinate process pancreatic cancer, which was related to the earlier and more frequent locoregional recurrence. This work was supported by the grants from the Beijing Municipal Science & Technology Commission (Z131107002213043 and Z161100000516038). Corresponding author: Dr. Yinmo Yang, Department of General Surgery, Peking University First hospital, 8th Xishiku Street, Beijing 100034, People's Republic of China. Phone: 86-10-83572772. Fax: 86-10-66119730. E-mail: yangyinmonet.